Celebrating 5 Years! Take Three! To me, SAALT is where we come together as a community and fight for the change we want, both for ourselves but also in solidarity with other communities-of-struggle. 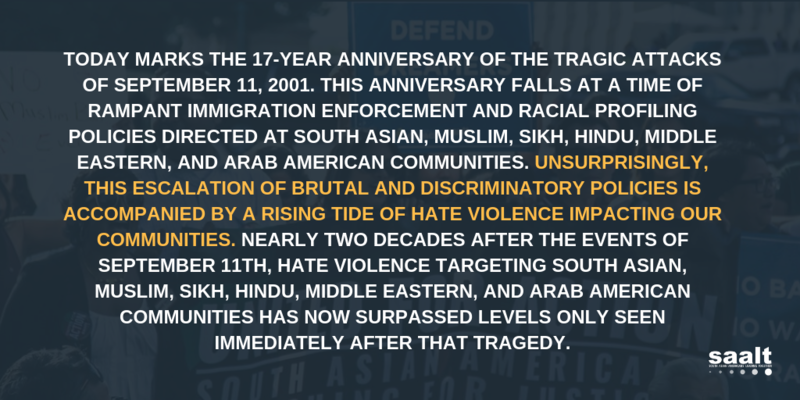 SAALT is an open and inclusive hub that invites the South Asian community, allies and partners to envision a world that is truly free and equitable. Moreover, SAALT is vehicle to help individuals make these lofty aspirations a reality. In five years, I see us doing this with ever more empowered, engaged people. This is only the beginning! This past July 4th weekend, the Islamic Society of North America (ISNA) hosted its 46th Annual Convention in DC, fittingly named “Life, Liberty and the Pursuit of Happiness.” It was my first ISNA experience, and I was in awe of the huge crowd. Thousands of people were in attendance as various speakers and panelists discussed topics relevant to the modern American Muslim. Many of those informative sessions were geared towards young people, as part of the MSA National and MYNA portions of the convention. While there was definitely a strong interest in the ISNA Matrimonials event, many attendees were drawn to the DC Convention Center by the dynamic speakers and the variety of goods and art available at the Bazaar. It was exciting to see the number of Muslims who came to DC for the event, and I was particularly impressed by the number of South Asians I observed attending the convention. Throngs of desis could be found in Chinatown restaurants, out on DC streets, and strolling the National Mall. My own cousins came to DC for the first time from California and Oklahoma specifically for ISNA weekend, and they were surprised by the number of South Asians in DC. So was I! While there are many South Asians living and working in and near the District, I don’t think I’ve ever seen so many in one place before. ISNA had a strong pull for our community, with sessions geared specifically towards South Asian Muslims, featuring South Asian speakers or moderated by South Asians, as well as many, many bazaar stalls that were put up by South Asian small business owners and artists. I liked that there were networking events, such as the Muslim Lawyers networking social that I attended Friday night, and info sessions, such as the one about getting jobs at federal agencies, that involved Muslims helping other Muslims. 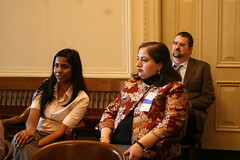 Not surprisingly, many of the faces at both those events were South Asian. It’s great to see people in the community taking interest in mentoring others! 3.) Do We Owe it to Rishi Rich? 5.) TECH: List of Major South Asian Twitter Voices! 1.) Is Light Skin Still Preferable to Dark? 3.) What Makes a Muslim Woman Powerful? Poverty in the Asian American Community in New York Featuring SAYA!